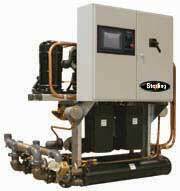 Chillers - R-Cap Process Equipment, Inc. This chiller has high efficiency scroll compressors. Can be roof mounted, installed on concrete pad or piers. Cooling capabilities from 60 tons up to 200 tons and water or glycol setpoint ranges of 40°F up to 85°F. Chillers can operate in ambient temperatures of -20°F up to 125°F. Environmentally friendly refrigerant. This chiller comes with high efficiency scroll compressors. Can be roof mounted, installed on concrete pad or piers. Cooling capabilities from 10 tons up to 60 tons and water or glycol setpoint ranges of 40°F up to 85°F. 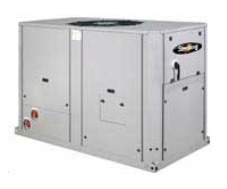 Chillers can operate in ambient temperatures of -20°F up to 125°F. These chillers offer the latest energy saving, magnetic bearing compressor technology and are 32% more efficient than screw compressor chillers at part load. Indoor water cooled condenser design. Cooling capabilities from 120 tons up to 190 tons and water or glycol setpoint ranges of 40°F to 60°F. Environmentally friendly refrigerant. This chiller has high efficiency scroll compressors. Reliable industrial design with two completely independent and redundant refrigeration circuits and an Allen Bradley PLC. Cooling capabilities from 30 tons up to 100 tons and water or glycol setpoint ranges of 30°F up to 65°F. Water cooled or remote outdoor condensers available. SMC Series Compact Portable Chiller. Space saving, portable, self-contained air cooled design. 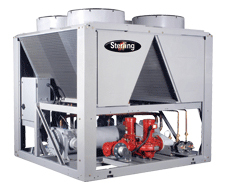 Cooling capabilities from ½ ton up to 1.5 tons and water or glycol setpoint range of 32°F to 75°F. Portable, self-contained design with high efficiency scroll compressors. Cooling capabilities from 2 tons up to 40 tons and water or glycol setpoint ranges of -30°F up to 75°F. Integral air cooled, water cooled, or remote outdoor condensers available, as well as completely outdoor systems.